The Aoudad is also known as a “Barbary Sheep” but is neither a sheep nor a goat. The animal originated in north Africa and is more genetically related to the cow. Both males and females have horns that grow out and back over their necks. A large male will weigh 250 pounds while a female will weigh 100 pounds. There are those who say the aoudad is the wildest and most elusive of all the exotic species in the United States. Here at Ambush Hill, there has always been an ample supply of aoudad. The aoudad has received a bad reputation as to their meat. There are aoudad jokes like “What do you call an aoudad female?” “An oumom.” Or the stories about covering the carcass with a burlap sack soaked in butter and garlic, roasting the meat, then throwing it away and eating the burlap sack. All of this is untrue. While a older male might have a strong taste, the females are delicious. The meat is white and mild like milk-fed veal. Of course how the animal is killed and processed makes a big difference in the meat. Properly and timely butchered and processed, aoudad is as fine a meat as Argentine beef. 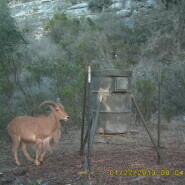 Pictured here is an aoudad the surveillance camera caught at one of the feeders. We never know what might be captured on the cameras.